Its not the first time I’ve found myself kneeling on the pavement in the pouring rain in London’s West End. But we’re not going to talk about that. This time I was doing it for you. I was kneeling outside of the Jimmie Martin shop in Kensington because I wanted to bring you the best possible image of these wonderful chairs that were on display in the shop window. Had it not been such a good evening it would probably have occurred to me to just go to their website. Oh well. Jimmie Martin is, in fact, Jimmie Karlsson and Martin Nihlmar. Together they make furniture for people who know what they like. 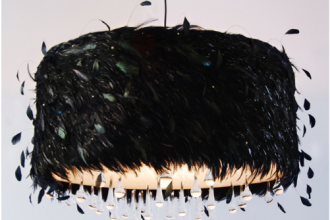 Their bold, witty designs have attracted the attention of celebrities, interior designers and the occasional party goer. Some of their work is available to purchase, much is custom made and if you really want to have fun, give these guys a whole space to fill. 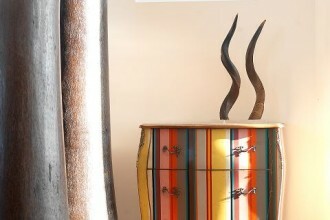 More wonderful chairs and other stunningly original furniture follows. 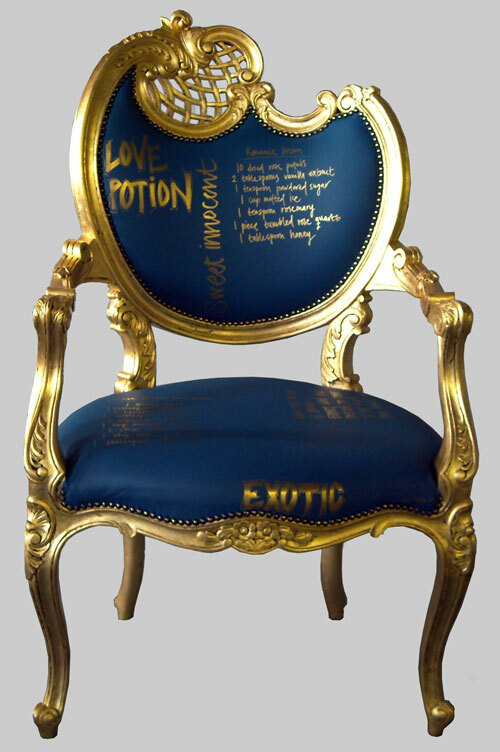 It’s a love potion chair. What else could it be? 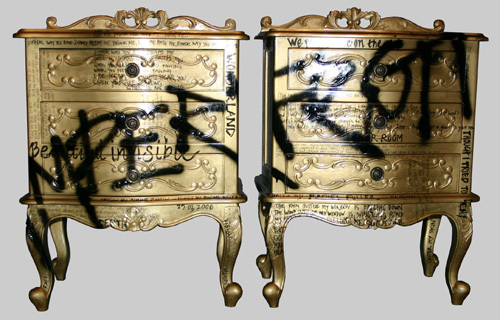 Jimmie and Martin developed their style decorating old furniture when they couldn’t afford to buy the new pieces they wanted. 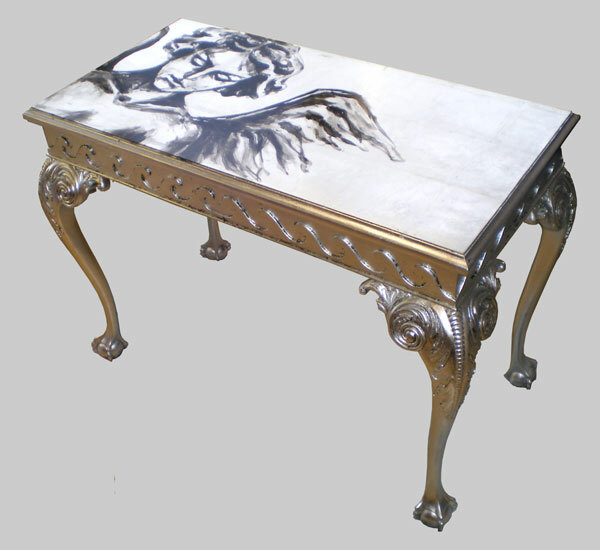 It was an apprenticeship which has led to some gorgeous creations. 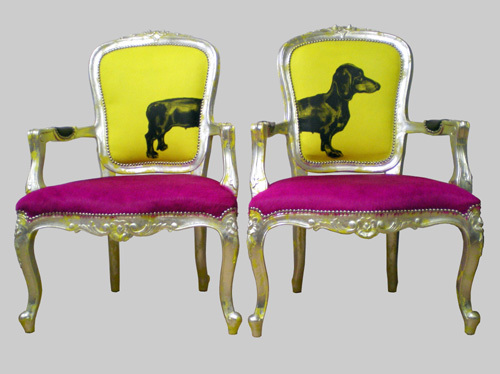 This Cameo Sausage dog sofa was commissioned for a client. 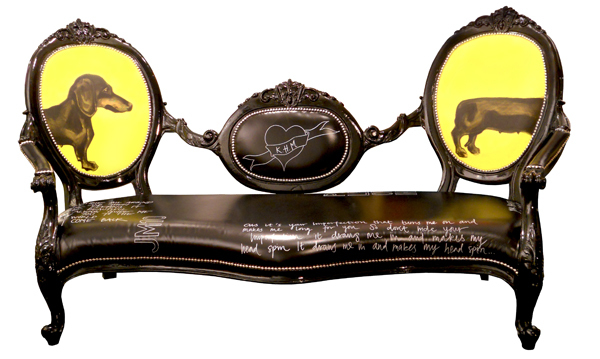 That’s soft black leather with white writing and a hand painted sausage dog . 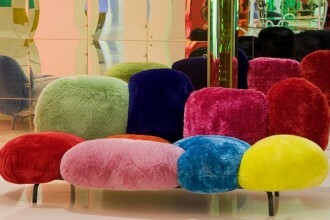 Nothing mundane could ever happen to someone invited to sit on this furniture. There is more fun, glamour and excitement here than in a month of musical opening night after-show parties. 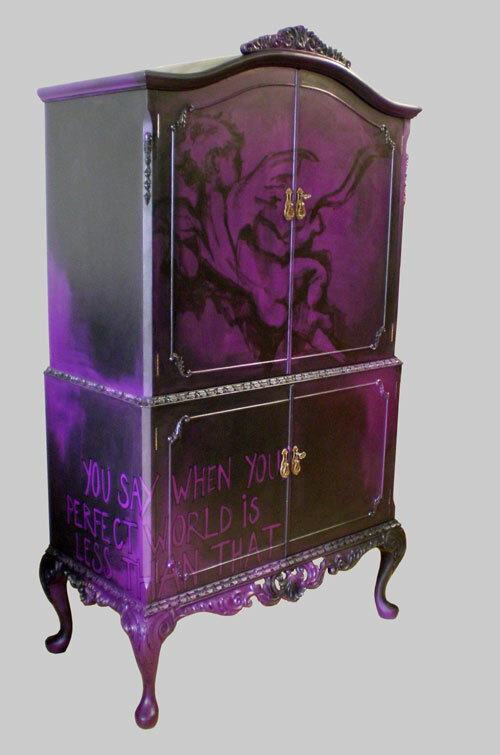 This pair of customised chests featurs the lyrics of Rachel Fuller, who, if you don’t know, is well worth seeking out. We’ll make it easy for you, here is her myspace page. Now you’ve got something to listen to while you read the blog. Aren’t we thoughtful? The chests are called Imperfection and, as you can see, these are sprayed gold. 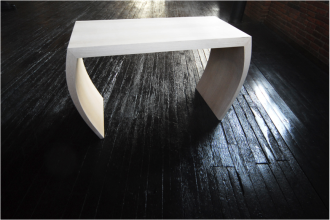 Why have boring furniture? 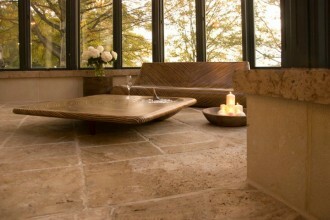 This glass top table is currently on sale in Liberty of London. Glamour with a sense of humour and romance. What more could you want? Maybe a nice big picture of a dog? Over here at Modenus Towers we’ve been having a very meaningful discussion about which we like most, pictures of dogs or pictures of cupid. 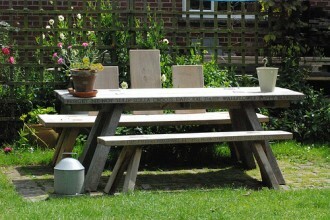 Me, well I’m a bit of a romantic but I have to admit that this is a seriously fine piece of furniture. But how about the following? I now also realise that I am rather fond of the color purple. Why don’t I have any purple furniture? 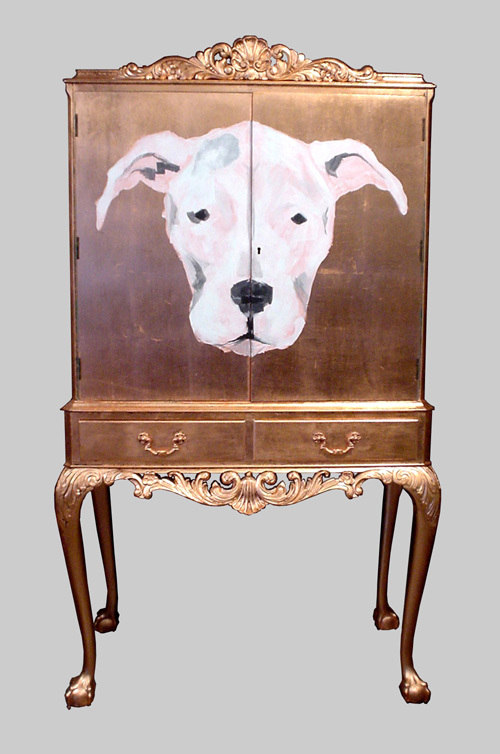 Jimmie Martin have lots of other cabinets all of them works of art in their own right. 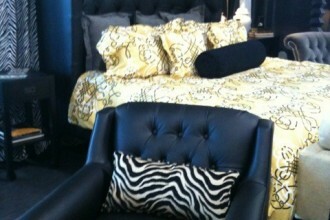 Some of the furniture we see with aspirations towards glamour misses the point. It can be a little dry, a little dusty. To work it needs a twist, a sense of humour and maybe a healthy helping of high camp. Just in case you had any doubt, there now follows a very healthy helping of high camp. 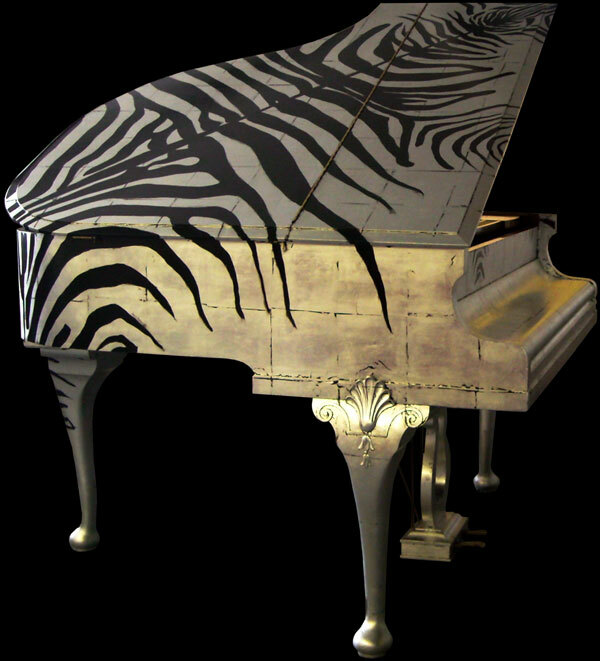 A private commission, this is, just in case you can’t believe your eyes, a baby grand piano in a silver leaf zebra design. Eat your heart out Elton, eat your heart out Liberace. If you are going to have a baby grand tucked away in the corner of the room flaunt it. Jimmie Martin have a style that is totally their own. We love them for it. I did the same thing! Walking down Ken Church Street with daughter – (she lives in London) – after drooling into the windows of Robert Kime, then POW, we were hit by a flash of lightning. Love love love their style, took pics, also forgot to go to their website, will do so right now!! Thanks for the heads up on Rachel Fuller, BTW, will look her up too! and if you like the sausage dogs they now come as cushions as well in lots of different colours and with a middle part! catalog as well, don’t you agree ?